This is one of my husband's favorite meals and I consider it the ultimate poached salmon recipe. I was inspired by watching Ina Garten bake a whole 10 lb. 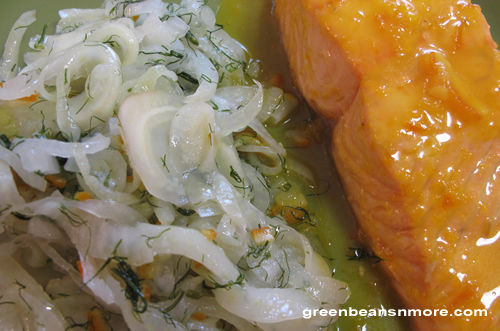 salmon using fennel and orange on one of her episodes and was intrigued by the flavor combination. This is a recipe that I've been "perfecting" since. This recipe uses salmon filets, not whole salmon. Poaching the salmon in the tasty orange marinade assures it stays moist. Like Ina's original recipe, this left over salmon (if there is any) makes a fantastic salad for lunch the next day. Place salmon fillets in a Pyrex dish skin side down. Whisk together vegetable oil, orange zest, fresh and carton/prepared frozen orange juice and marmalade. Pour over salmon to cover. Let marinade in the refrigerator one to two hours the turning fish once. Due to cooking time start the fennel dish first. Slice onion thinly in rounds. Prepare fennel bulb (remove hard outer layer and remove core). Slice thinly. Retain some of the fennel fronds to add later. Heat vegetable oil in pan over medium heat. Add onion and fennel. Cook until soft. Stir in a tablespoon or two of the orange marmalade. In a deep large skillet place all the marinade and the salmon (skin side down first) . Bring to a simmer and poach at medium-high heat 4 to 6 minutes. Cooking time is dependent on thickness of the fillets. Place salmon on plates. Cover or put in warm oven to keep warm. Continue cooking sauce until it thickens. Pour sauce over fish and fennel.